It’s the dead of winter. It’s the High Noon Saloon on a Monday. It’s a $5 cover. The soundcheck is so long it’s a candidate for personhood. 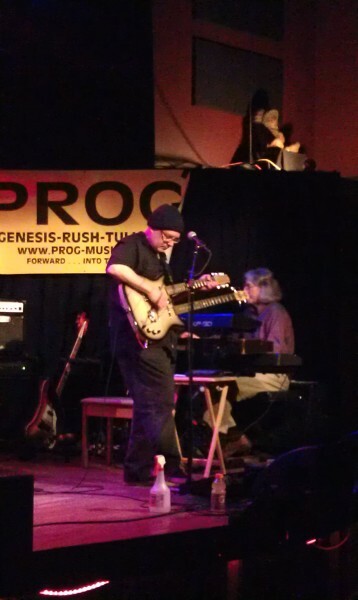 That means this must be PROG, Madison’s devotees to the deep vein of 70s progressive rock. Nominally, PROG gives equal weight to the works of Yes, Genesis, Rush, and Jethro Tull. Presenting lengthy and complicated pieces of music with often-undocumented solos is no mean feat, and having them on offer at a local club for a five spot is no small value. As showmen, PROG takes a low-frills approach to covering these complex works. Touring acts such as The Musical Box and Security Project feature singers who labor to authentically reproduce every one of Peter Gabriel’s shrieks and cries. But there are no fake Mellotron housings, glittering capes, or authentic 1970s laser shows to be found on the High Noon stage when PROG is on. Just four musicians and a lot of instruments. When both the bass and guitar player have double-neckers in the arsenal, you know it’s serious. After opening with the Rush instrumental “La Villa Strangiato,” a recent staple which shows off the band’s strengths as a unit, the remainder of the first set consisted of the 1972 Yes album Close to the Edge, in order and in its entirety. This marked the PROG public debut of the 19-minute title track, followed by album-mates “And You and I” and “Siberian Khatru”, both previously in the band’s arsenal. The harmonies and jams of “Siberian Khatru” which made it a popular opening number for Yes on many tours also serve PROG well. The maiden voyage of “Close to the Edge” was not without its rough patches—PROG as a unit can struggle at times to cleanly transition between movements in the longer and more complicated pieces on their playlist, CTTE included—but impressed the highly partisan crowd who clearly knew the song by heart.With lead vocalist and drummer Steve Phipps trapped behind his Sonor drumkit (complete with glass shielding at this show) and therefore physically constrained from playing the traditional role of frontman, keyboard player Michael Butkus-Bomier (“Michael B-B”) acts as compère. His task: to pad out the sometimes lengthy gaps caused by instrument swaps and tuning with deliberately groan-worthy banter. Lead guitarist Joe Allard and bassist Gordon Ranney remain diligently focused on the tasks at hand, rarely breaking concentration even as their feet search for the right pedal and their fingers fly across the strings of an ever-changing variety of instruments. Since picking up the 12-string guitar, both have made tremendous strides toward recreating some of the more delicate moments of the songs on the PROG lineup. 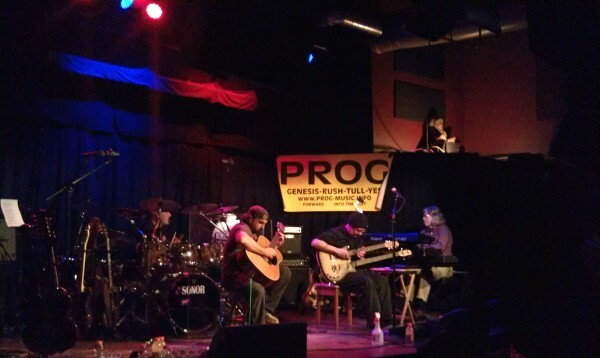 Until recently, PROG’s lineup featured a singing flautist and guitar player, a spot alternately filled by Scott Eagle and Josh Becker, who would typically take lead vocals on Jethro Tull tunes as well as some Rush and Genesis numbers. With the band moving on without either of them, the band’s attention to Tull has fallen off dramatically. The sole Tull entry on the playlist was “Minstrel in the Gallery”, featuring the normally silent Allard on lead vocals during the song’s introduction before giving way to Phipps. Ranney, normally steady and reliable on primary backing vocals, takes lead on Rush’s “Jacob’s Ladder.” Following the band’s evolution it is impossible not to notice the gap created by losing the secondary lead vocalist—the setlist appears structured to give Phipps’ voice the rest periods it clearly needs after chasing the high notes laid down on vinyl by a much younger Jon Anderson. Despite glossing over Tull and featuring a complete Yes album, PROG actually mounted a very well-balanced setlist for the evening. Rounding out the night, the band shared “Cinema Show” and “Supper’s Ready” from Genesis, and closed with their strongest straight-ahead rocker, Rush’s instrumental “YYZ.” Most of the PROG members have an obvious affinity for one of the bands represented in the playlist, and as soon as he starts his first Genesis tune of the evening it is obvious where Phipps’ loyalties lie. “Cinema Show”, which featured both Allard on a 12/6 double-neck and Ranney on a 12/4, was the prettiest performance of the evening, and the band’s rendition of the 23-minute “Supper’s Ready” has grown since its debut.